Editor's note: A point of pride. The new U.S. Amateur champion attends my alma mater, San Diego State. JOHNS CREEK, Ga. – Gunn Yang, 20, of the Republic of Korea, defeated Corey Conners, of Canada, 2 and 1, in the 36-hole final match Sunday to win the 2014 U.S. 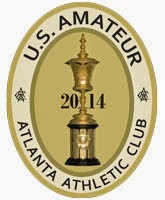 Amateur Championship at Atlanta Athletic Club’s 7,208-yard, par-71 Highlands Course. “I was just trying to make it to the match-play portion, really,” said Yang, a San Diego State University sophomore who had back surgery in May 2013. Yang, who grew up in Korea and played competitive amateur golf in Australia for five years, is the second Korean-born player to win the U.S. Amateur, joining Byeong-Hun “Ben” An, who claimed the title at Southern Hills Country Club in Tulsa, Okla., in 2009. “I haven't won a tournament for a long time, like maybe five or six years,” said Gunn.